The Parasite Chambers is a high-level dungeon that was released for Halloween 2017 (October 24, 2017) for Patch X.18.0. It was based off the scrapped Kabam-era dungeon called the Parasite Den. The dungeon is a good source of Potions of Mana and drops a large number of untiered items. The dungeon has a chance of dropping from Scout Colonies, which spawn in parasite ruin setpieces in the Highlands. The Parasite Chambers Key is available in the Nexus for 200 . 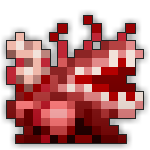 See the Parasite Chambers Guide for a walkthrough on the dungeon. The dungeon consists of a series of varying rooms linked by hallways that are blocked off by destructible barriers. The boss is found in a larger room, accessible only from the sides. There are always exactly 3 dead ends (not including spawn or boss rooms), each of which can be a Treasure Room. Explosive barrels are scattered liberally throughout the dungeon. If a player touches a barrel, it will roll in the direction that the player was moving in before exploding in a wide radius, dealing 900-1100 armor-piercing damage (that counts towards the player that rolled it’s Soulbound) to any enemies caught in the blast while inflicting Armor Broken for 3 seconds. In addition, getting hit by a barrel will remove any Invulnerability the enemy had. Once a barrel explodes, it will respawn in the same place shortly after, flasing green after a few seconds to indicate it is ready to be thrown again. If a player is caught in the explosion, they will not take any damage but will be Armor Broken for 3 seconds. Since many of the enemies (including the boss) have absurdly high amounts of Defense and permanent invulnerability, utilizing these barrels is crucial to defeating them. The Treasure Rooms in the dungeon are always at dead ends. This room is a small circular chamber with several Blood Slurps within and is the only room with candelabras. In the center of the room, there will be a harmless Infested Chest that can be destroyed for additional loot. It is possible to find 3 Treasure Rooms, but this is very rare. An important thing to note is that some enemies (including the boss) have HP that scales with the number of players in the dungeon, so the HP values that they have are only the minimum. The increase for this particular dungeon is +20% of Base HP per player in the dungeon, which adjusts every 30 seconds to account for players that exit or join the dungeon. This makes the dungeon harder the more players you have. Since the colonies (including the boss) have an absurd amount of defense, any class that can deal Armor-Piercing damage will make the dungeon massivey easier by removing the need to use the Explosive Barrels. Examples include Priests/Sorcerers with the Crystal Wand, Rogues/Assassins/Tricksters with the Queen’s Stinger Dagger, and Wizards with Ancient Spell: Pierce. -There is a myth which says that if there is another room after the boss room, there will be at least one treasure room in the dungeon, although this has not been proven.